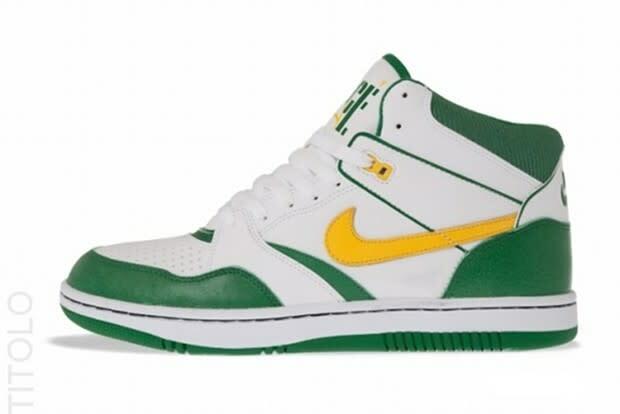 Nike Sky Force 88 Mid "White/Varsity Maize/Pine Green"
An old-school Oregon colorway hits a late &apos;80s basketball classic for a sick duo. The mainly all white leather upper features Pine Green around the outsole as well as some other spots, contrasting nicely with touches of Varsity Maize to the Swoosh, tongue, and upper lacelet. Rock these this summer during pick-up basketball or casually. Head over to Swiss retailer Titolo and get yourself a pair.